The key to remem­ber­ing, for Knaus­gaard, is to describe the phys­i­cal world, and by writ­ing about and focus­ing on the past he finds access to a world that seemed for­got­ten or lost. This seems to work for his read­ers as well, or they wouldn’t find his nov­els addic­tive. How­ev­er, the ques­tion is: Are there too many – irrel­e­vant or dys­func­tion­al – details? 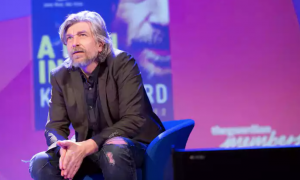 Wood might answer yes, as for him «the arti­fice lies in the selec­tion of detail.» Or is Knausgaard’s just anoth­er (extrem­ist or exces­sive) form of con­ven­tion­al real­ism? Can such an abun­dance of detail achieve what Hem­ing­way – at the oth­er end of the spec­trum – tried to bring off by «search­ing for the unno­ticed things that made emo­tions», pur­pose­ful­ly leav­ing out «the under­wa­ter part of the ice­berg», as he apt­ly put it in his Paris Review inter­view 60 years ago?